Having tickets to see the Mets play in the World Series is an exciting event on its own. Taking a Delta/Mets branded taxi with Mike Piazza and Jim Breuer to the game makes it even more exciting. Piazza was my favorite Mets player for the longest time and I still absolutely love him. 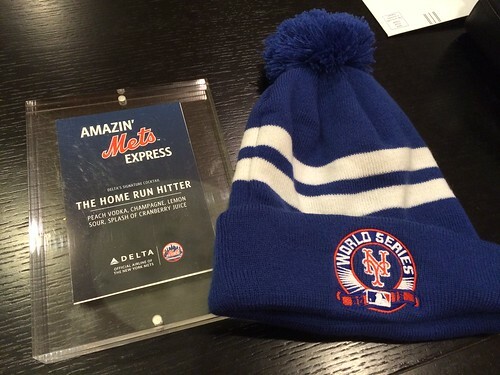 On Thursday, the day before game 3 of the World Series, the Mets and Delta did a scavenger hunt over social media, tweeting clues for fans to find the water taxi tickets. Someone in New York had gotten tickets, but couldn’t use them. This person joined the Mets Fans in Chicago Facebook group a week ago because he was here for a trip and wanted to watch the other games with Mets fans. So he posted in the group on Thursday night if anyone was coming to New York and wanted the tickets. I chimed in and was able to arrange getting them. The rest of the story is best told verbally, but I’ll do my best here to explain the amazing experience Nik and I had. 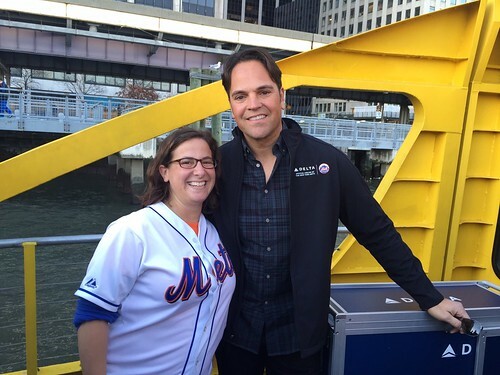 Piazza was there with his wife, and some security stayed nearby him, but he pretty much roamed the boat and all the passengers, about 80 of us, had unobstructed access to him for pictures, autographs and conversation. His wife took a seat in the row in front of us and was pretty personable too. I later got a picture with her and she was part of a group selfie. I was so wrapped up in being inches away from Piazza that I didn’t take many pictures of the beautiful New York scenery. I did make my way outside and upstairs for a few minutes though, which is where I got my picture with Breuer. He too was ridiculously nice. He later came inside and told one of his epic Mets stories and it was hilarious. 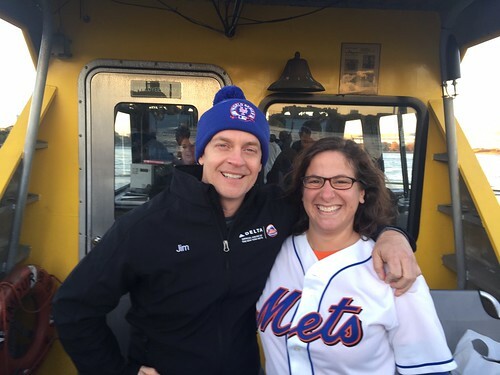 Jim Breuer Epic Mets Story from Julie on Vimeo. 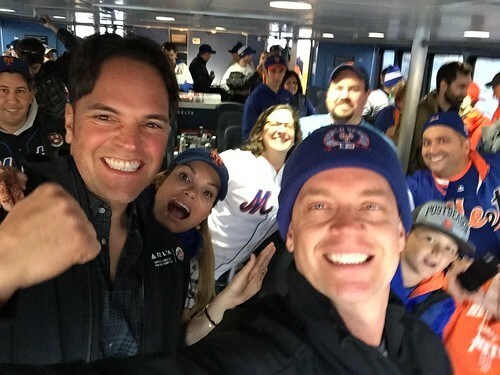 Not sure how it started, but I see Breuer and Piazza take a selfie and think to myself, I should get one. (Turns out he was taking video that ends up in this Rolling Stone piece. Water taxi video starts at 1:36 in.) So Nik hands his phone over and it happened! Me, Nik, Breuer, Piazza, his wife and a few nearby fans are in one selfie together. I mean, this whole ride is unlike anything I’ve ever experienced before. We arrived at the Worlds Fair Marina about an hour later and took a short walk over to Citi Field where we would enjoy the Mets winning a World Series game. This water taxi experience is something I will never forget. I can only think of one word to describe this: AMAZIN’! Wow!